SUGG'S CREEK, LEBANON PRESBYTERY, TENN. The Sugg's Creek congregation was organized by Rev. Samuel Donnell, a Presbyterian minister, in 1800. The first ruling elders were William Hannah, John Hannah, Hugh Tilford and Robert Law. Mr. Donnell was pastor of the church two years. Soon after the organization the church and community began to feel the influence of the revival of 1800. There was a decided leaning toward the "revival party" by the membership of the church. Mr. Donnell resigned, and preaching was supplied by Rev. Alexander Anderson, Rev. Samuel King and others. In 1808 David Foster, a licentiate in the Presbyterian Church, took charge of the work. Immediately after the organization of Cumberland Presbytery--the beginning of the Cumberland Presbyterian Church--in the house of Samuel McAdow, in Dickson County, Tenn., February 4, 1810, the sympathies of the pastor and people at Sugg's Creek carried the congregation into the new organization. David Foster was ordained by the new presbytery July 27, 1810, at the Sugg's Creek church and was appointed pastor over that congregation and the churches Stoner's Creek (now Cloyds) and Fall Creek (now Jerusalem). The pastorate thus begun remained unbroken eighteen years. The new board of elders was composed of men of sterling character. They were John Roach, Sr., John Curry, Reuben Wood, Sr., and James Law. Rich Beard, D.D., of illustrious memory, who was personally acquainted with all these men, having spent several months in the neighborhood as a student under Rev. David Foster, often held up these men as elders of the highest type, calling them "giants of their day." A strong board of elders has always blessed this congregation and the present board, consisting of the following men, stands worthily in the place of its predecessors: John G. Brown, M.D., Edward W. Bland, Wm. M. Myers, W. H. Robbins, A. H. Smith and Sanford F. Smith. The deacons are: James M. Myers, Ross M. Brown, Isaac N. Jones and Ben. N. Robbins. Isaac N. Jones and Bennie N. Robbins form our present official board. Pastors.--Rev. John Beard was called in 1828 to succeed Rev. David Foster as pastor. He was in charge of Sugg's Creek, Cloyd's and Cane Ridge for twenty years, with an intermission of a year or two which was filled by Rev. John N. Roach. Rev. B. D. Moore, of McMinnville Presbytery, served for two or three years. Rev. J. B. Jackson was called in 1852 and served until 1856. He having resigned, Rev. J. L. Alexander, present acting stated supply, was called indefinitely and served till 1884, being relieved one year by Rev. William Wilson and two years by Rev. Andrew W. Smith. In 1884 Rev. W. R. M.Crump, of McMinnville Presbytery, was called and served three years. From 1884 till 1898 the pulpit was supplied by a number of students from the Theological Seminary, Lebanon, Tenn., prominent among whom were Rev. C. C. Russell, George M. Oakley and Herbert L. Walker. The present acting supply, Rev. J. L. Alexander, was called again to this work in 1898. During the century's existence of this church there have been held at least fifty great camp meetings and equally as many protracted meetings. In the early part of the century the preaching in these meetings was done by fathers of our church, among whom were Finis Ewing, John and William Barnett, Thomas Calhoun, Alexander Anderson, T. C. Anderson, Robert Donnell, George Donnell and later on by J. M. McMurry, Richard Beard, D.D., Hugh B. Hill, A. H. Alsup and others. Out of these meetings thousands have gone forth, born of the Spirit to bless the world. From this church have gone forth fifteen or more Cumberland Presbyterian preachers. Other preachers of our own and other denominations claim Sugg's Creek church as their spiritual birthplace. The first church house at this place was built in 1800. It was an oak log house, heated by an old-fashioned chimney and fire place on the site of which the new house now stands. The first house was torn down and replaced by a new cedar log house, of twelve corners, in the year 1834. In the meantime a large camp meeting shelter, 55x85 feet, was built to accommodate the vast concourse of people attending services here, especially during camp and protracted meetings. 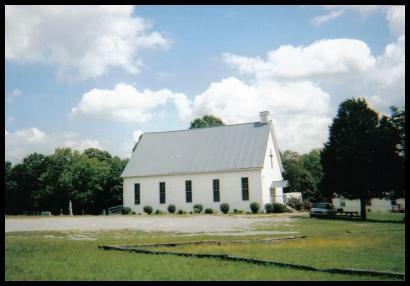 It was on this consecrated ground and in the first house erected thereon that the second meeting of the Cumberland Presbyterian Synod was held in the autumn of 1814, in which meeting the Confession of Faith of the Cumberland Presbyterian Church, a revised form of the Westminster Confession, was adopted. The second house, with the shelter, was taken down in 1898 and has been replaced by a new building, which was dedicated May 20 of this year. The building of this house is the result of the consecrated energy and self-sacrifice of the official board and membership, together with the liberality of the entire community. The entire cost of the building was $1,710. Sugg's Creek, Tenn., where the Westminster Confession Was Revised. BY REV. J. L. ALEXANDER. SUGG'S Creek Church was originally organized as a Presbyterian church by Rev. Samuel Donnell in 1798. Most of its members having been brought under the influence of the great revival of 1800 and Samuel Donnell, the pastor, not being at all in sympathy with this gracious work, he withdrew from the pastorate as early as 1801, yet continued to visit this people occasionally until 1808. In the meantime the church was supplied with preaching by men of the revival party in the Presbyterian Church, among them being Thomas Calhoun, William McGee and Samuel King. 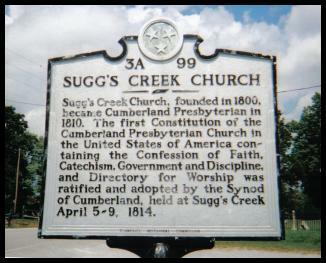 Soon after the organization of the Cumberland Presbytery in 1810, it held its third session at the Sugg's Creek Church. This was in July and at the time Licentiate David Foster was ordained to the ministry and installed as pastor of Sugg's Creek and Stoner's Creek (Cloyd's) congregations, under the care of the newly organized presbytery. At this time the congregation was formally reorganized, the following persons being elected as ruling elders: John Roach, John Currey, Reuben Wood, Sr., James Law and Hugh Tilford, Sr. These were men of sterling integrity and were described by Dr. Richard Beard as "giants in their day" and the best bench of elders he ever knew. The fourth regular meeting of Cumberland Presbytery was held at this church, April 7, 1812. It was at the Sugg's Creek Church during the pastorate of David Foster that the second meeting of the Cumberland Presbyterian Synod was held, at which meeting the committee previously appointed for the revision of the Westminster Confession of Faith submitted their report. Of this revision the synod said: "They have endeavored to erase from the old Confession the idea of fatality only, which has long since appeared to them to be taught in part of that book. But, notwithstanding that the synod have ventured to model, to expunge, and to add to the Confession of the General Presbyterian Church, yet they are free to declare that they think that to be, in the main, an admirable work, especially to have been framed so shortly after Roman superstition and idolatry had almost covered the whole Christian world." After due deliberation the report was adopted, thus marking the time and place with great historic interest, as undoubtedly the adoption of this report marks a most important epoch not only in Presbyterianism but in the religious beliefs of almost the entire Christian world. David Foster was succeeded in the pastorate by Rev. John Beard, who served the church from 1828 to 1849. Thus we see that the church had but two ministers from 1808 to 1848. During these two pastorates thirty-five or forty-nine camp meetings were held in the bounds of each of these congregations and hundreds of souls were born of God, many of the new converts becoming ministers of the gospel. Rev. Bird Moore and Rev. J. B. Jackson were the next pastors at Sugg's Creek. In August, 1856, Rev. J. L. Alexander was called to take charge of this church and Cloyd's. He remained the pastor of Sugg's Creek until 1884 with the exception of five years, during which the church was supplied by other ministers. From 1884 to 1898 Sugg's Creek was supplied by theological students. Mr. Alexander was then called again to the pastorate and served the church until 1901. During this pastorate the present church building was erected at a cost of $1,700. This is the third building the congregation has had. The first was built in 1800, the second in 1834, and the third was dedicated, free of debt, in 1899. The Sugg's Creek congregation was organized by the Reverend Samuel Donnell, a Presbyterian minister in 1800. The first ruling elders were William Hannah, John Hannah, Hugh Tilford, and Robert Law. Mr. Donnell was pastor of the church two years. Soon after the organization the church and community began to feel the influence of the revival of 1800. There was a decided leaning toward the "revival party" by the membership of the church. Mr. Donnell resigned, and preaching was supplied by the Reverends Alexander Anderson, Samuel King, and others. In 1808 David Foster, a licentiate in the Presbyterian Church, took charge of the work. Immediately after the organization of Cumberland Presbytery, the beginning of the Cumberland Presbyterian Church, the sympathies of the pastor and people at Sugg's Creek carried the congregation into the new organization. David Foster was ordained by the new presbytery July 27, 1810, at the Sugg's Creek church and was appointed pastor over that congregation and Stoner's Creek (now Cloyds). The pastorate thus begun remained unbroken eighteen years. The new board of elders was composed of men of sterling character. They were John Roach, Sr., John Curry, Reuben Wood, Sr., and James Law. The Reverend John Beard was called in 1828 to succeed the Reverend David Foster as pastor. He was in charge of Sugg's Creek and Cloyd's for twenty years with an intermission of a year or two which was filled by the Reverend John N. Roach. The Reverend B. D. Moore, of McMinnville Presbytery, served for two or three years. The Reverend J. B. Jackson was called in 1852 and served until 1856. He having resigned, the Reverend J. L. Alexander was called indefinitely and served until 1884, being relieved one year by the Reverend William Wilson and two years by the Reverend A. W. Smith. In 1884 the Reverend W. R. M. Crump of McMinnville Presbytery was called and served three years. From 1884 until 1898 the pulpit was supplied by a number of students from the Theological Seminary, Lebanon, Tennessee, prominent among whom were C. C. Russell, G. M. Oakley, and H. L. Walker. The Reverend J. L. Alexander was called again to this work in 1898. During the century's existence of this church there have been held at least fifty great camp meetings and equally as many protracted meetings. In the early part of the century the preaching in these meetings was done by the fathers of our church, among whom were Finis Ewing, John and William Barnett, Thomas Calhoun, Alexander Anderson, T. C. Anderson, Robert Donnell, George Donnell, and later on by J. M. Murry, Richard Beard, D.D., Hugh B. Hill, A. H. Alsup, and others. Out of these meetings thousands have gone forth born of the Spirit to bless the world. From this church have gone forth fifteen or more Cumberland Presbyterian preachers. Other preachers of our own and other denominations claim Sugg's Creek church as their spiritual birthplace. The first church house at this place was built in 1800. It was an oak log house heated by an old-fashioned chimney and fire place on the site of which the new house now stands. The first house was torn down and replaced by a new cedar log house of twelve corners in 1834. In the meantime a large camp meeting shelter, 55-85 feet, was built to accommodate the vast concourse of people attending services here, especially during camp and protracted meetings. The second house, with the shelter, was torn down in 1898 and has been replaced by a new building which was dedicated May 20 of this year. The entire cost of the building was $1,710. It has been impossible to secure the needed information to bring this material up-to-date. "The Cumberland Presbyterian," August 2, 1900, page 103. The third Sunday in May the historic 176 year old Suggs Creek CP Church in Wilson County, TN, had what was perhaps its second biggest day in its history. With all day activities, the congregation unveiled a historical marker which had been erected by the Tennessee Historical Society pointing to the importance of the church as the place where the Confession of Faith of the Cumberland Presbyterian Church was adopted April 5, 1814--which was the church's biggest day. The church, which was founded in 1800, even before the CP denomination came into being, ten years later, celebrated the historic day with a special service of worship in the morning with C. Ray Dobbins, editor of The CP, as visiting preacher, dinner on the grounds, and an afternoon service observing the unveiling and dedication of the historical marker. Directing the days activities was pastor Calvin S. Cunningham, who serves the congregation two Sundays a month along with the New Hope Church, also in Murfreesboro Presbytery. The afternoon service was directed by presbyterial missionary, Don Reeves, with the sermon given by Alfred Bennett, pastor of the also historic Old Beech church at Hendersonville. Following the sermon the congregation went in procession to the marker at the front of the church yard. Unveiling the marker which was covered with American flags was Sue Hamblen. Mr. Dobbins read the inscription which is as follows: "Suggs Creek Church: Suggs Creek Church, founded in 1800, became Cumberland Presbyterian in 1810. The first constitution of the Cumberland Presbyterian Church in the United States of America containing the Confession of Faith, Catechism, Government and Discipline, and Directory for Worship was ratified and adopted by the Synod of Cumberland, held at Suggs Creek, April 5-9, 1814. Historical marker, 1976." Mrs. Fannie Sugg, octogenarian from Dearborn, MI, and a descendant of the Sugg family, was present. He daughter, Mrs. Geneva Swain gave a report on the genealogy of the family. Edward B. Baggett of Clarksville, TN, also a descendant of the Sugg family, was present. Pastor Cunningham had in his possession a copy of one of the original confessions of faith, which was adopted in 1814 and was published in 1821. He also had another copy of the revised Confession of 1828. During the dedication service, letters were read from prominent government and church leaders. These included Tennessee Governor Ray Blanton, Tennessee Senator Howard Baker, and Congressman Joe L. Evins. Church leaders sending letters were: Moderator Roy Blakeburn, of the General Assembly, and Wendell Trotter, Moderator of Tennessee Synod. A group from the Mount Juliet-West Wilson Historical Society attended the dedication, many of them wearing costumes of the 1800's. Also attending the service was a descendant of Samuel McAdow, one of the three organizers of the original Cumberland Presbytery: Mary Gaines (Mrs. Hugh) Evans, of Lebanon, TN is a great-granddaughter of Samuel McAdow. Mrs. Evans is a Methodist. "Suggs Creek Cumberland Presbyterian Church, an Early History," is a 52 page publication written and printed by Thomas E. Partlow of Lebanon for the celebration. He is a friend of the congregation. Perhaps Suggs Creek Church's most famous day was in 1814 when it was the setting of the adoption of the Confession of Faith of the church. Easily, its second greatest day was the third Sunday in May when a historical marker was dedicated.